As soon as you find yourself becoming distracted, retrain your focus on the road. Where possible, ask a passenger to take control of the stereo, change tracks on a CD player or operate a satellite navigation system. If you're driving alone, then make sure to stop before using such devices. Even if you're stopped in traffic or at traffic lights, you are still in control of the vehicle and could be prosecuted for using a mobile phone. However tempting, do not use a mobile phone while driving. 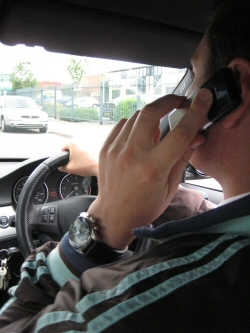 Let calls go to voicemail and wait until you are parked safely before you check voice or text messages or make calls. Don't be distracted by conversations with passengers. It is always safest to stop talking when you need to concentrate. If you call somebody who is driving, tell them you will call back later and hang up. Be wary of wearing headphones as this could delay the speed of your response to external events. Ensure SatNav is placed in a sensible position (bottom right hand corner of the windscreen). Only adjust or programme it whilst stationary. Though it isn't illegal to use a mobile phone while cycling, cyclists still need to maintain concentration and you could be prosecuted for careless or dangerous cycling.